There's a spot on 41st St, right there by the busiest intersection in the state, where the sidewalk/pedestrian traffic merges with the right turn only lane on a 40,000 vehicle per day road. Oh sure there's a myth worth of protection in that spot - a nice 5 inch wide white line painted from one sidewalk edge across to where the sidewalk continues after crossing a right turn only entrance and a right turn only exit from a Walgreen's parking lot. I cannot believe nobody's died there. It had to be this way. Without the pedestrian/motor vehicle merge there'd be no way to enter Walgreens by car, therefore there'd be no way to have a Walgreens. I'm certain the traffic engineers did the best they could - but really, we must have a Walgreens and the Walgreens must be accessible by car. Besides, people would be crazy to go to that place without 4,000 lbs of steel and glass for protection. Sunday I arrived at that merge by bike. By bike? On the sidewalk? DON'T ride on the sidewalk. That's a good way to get hit by right turning traffic. Ride in traffic. The safest place to be in that spot is behind the car in front and in front of the car behind. Where we can all see each other and smile. All friendly like. Sunday I arrived at that merge by bike. I discovered an SUV turning right. I and the SUV may have gotten intimate - for just a moment. Better hurry and get 41st a redesign. People would kill to get into Walgreens. You get these youngsters on bikes and you never know what sort of danger they'll put themselves in. I guess The Dad was pretty happy to be leaving work last Friday. Looking for Valentine's Day content? Please check out Monday's Yehuda Moon. I took advantage of the beautific temperature today and headed out for a small adventure. I let the Pugsley decided where to take me and it soon became clear we'd be visiting Leaders Park. By way of the I29 Pedestrian Bridge, Falls Park, DTSF, Caribou Coffee, and finally The Broken Chain - which isn't so much a venue but a state of drivetrain. Leaders Park is the site of the singletrack build. Having not been there since October - and always holding a vision in my head of a dude standing over our bridges with a sledgehammer - I wondered how our bridges have been holding up. I discovered bridge #1 still standing. Bridge #2 was standing still. Anybody seen my sunglasses? I swear I had them when I arrived at the park. January's South Dakota Bike Summit was remarkable for many reasons - but for me, one reason needs a little more mention - and today's just the right day. First there's coalition VP Jessica - without whom there would have been no summit. Friday night's social-ness was hosted by Amy, the other woman on the coalition board. Of the three keynotes there was Ann Freiwald: Alta Planning & Design, Heather Brutz: Transportation for America and Ginny Sullivan: from Adventure Cycling. Coincidence? Not fully. Planned? Not overtly. Good? Absolutely. Today. Sabbath. I'm getting some reading done and found my way to Esquire Magazine's profile of Janet Sadik-Kahn - New York City's Traffic Commissioner. "In the most elementary terms, Sadik-Khan has plucked the city from under the chassis of the automobile and distributed it, Robin Hood — like, to runners and cyclists and mothers with strollers and large men with small dogs." "Go find Sadik-Khan pedaling her Specialized Globe bike from her home in the West Village to her office downtown. Tell her you know, dammit, that traffic in midtown is worse. She will smile and say, Listen. If vehicles are going more slowly, then that's safer for everyone! She will say that vehicle-related injuries are down a tremendous 63 percent." "Like Bible-thumpers and vegans, she has a million different figures memorized cold. She has them organized into trees. If you go this way, she will cut you off with this branch of reasoning. Head in that direction and she has a unique countering set of facts. Either way, it trickles down to the same end result. You have your tardy-to-work card, but she has just saved a few hundred lives. One argument is the clear winner, and it doesn't drive a Honda." "But to anyone with a clear enough scent of human ambition, this is about more than New York. At the intersection of visionary and engineer you'll find the personal aspiration that is, often, what drives change like this. New York is a testing zone; Sadik-Khan is using it to show the world — the president — what the world city of the future could look like. "If you can do it here," she says with a smile, "you can do it anywhere." I'm off to find and read the new Rapid City Pedestrian & Bike Plan. The Boys found their way outside today. The Boy 8 built a snowman. Then sent him for a ride. KELO Thinks It's Cold Out! Two of my favorite people ended up on the news last night. One for riding his bike in the cold. One for being an enabler. 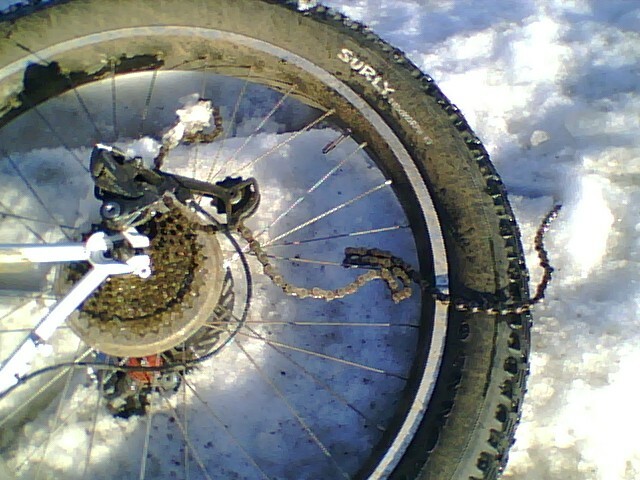 Snakebite and The Owner keeping local cycling visible in early February. Tuesday February 8 there are two open houses related to the multi-use path corridors that endeavour to connect Sioux Falls to Brandon, Harrisburg and Tea. The hard work of considering routing options and receiving community input has mostly been completed. This MPO report details the "most feasible" routes between the communities. People who attend either open house ought to keep an ear open for approaches that Brandon, Harrisburg and Tea are taking to preserve the corridors until such a time when funding is available to build the facilities. Why? 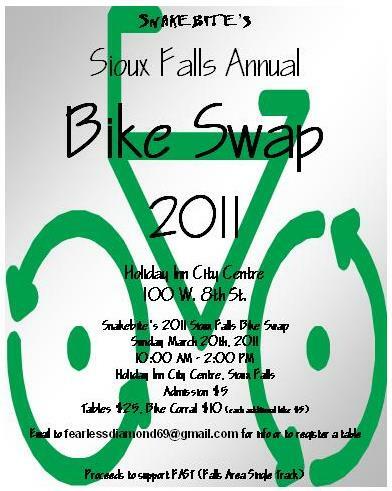 I suspect that Sioux Falls will be slower to act on preserving the corridors than our neighbors. If this proves correct - pressure might be able to be successfully applied locally by pointing to the value of being good neighbors. For me the big value of having these routes in place is not so I can ride my bicycle from home to Brandon. No. The big value of having these in place is, over the next 20 years as the land between these communities is urbanized, bicycle and pedestrian access to transportation will not be an afterthought. It will already exist. When a Wal-Mart lands between here and Harrisburg they just might cater just a little bit to the bike route that already exists. Sometimes the blog posts write themselves. Other times the blog posts appear in my inbox already written. 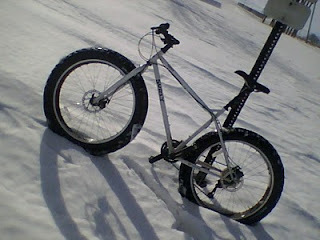 29" tall...2.1" wide...294 replacable studs...2lbs 10oz...pure ice / snow pack dominace...screw you 33rd and prairie...! I think everybody should get e-mails like these. I think they'd ride more. Tomorrow is going to be a beautiful day! Don't let it get away.